1. Heat the oven to 325 degrees. Lightly oil a large baking dish (9-by-13-inch works well). 2. Trimming the cabbage: Peel off and discard any bruised or ragged outer leaves from the cabbage. The cabbage should weigh close to 2 pounds If the cabbage weighs more than 2 pounds, it won’t fit in the baking dish and won’t braise as beautifully. To remedy this, cut away a wedge of the cabbage to trim it down to size. Save the leftover wedge for salad or coleslaw. Then cut the cabbage into 8 wedges. Arrange the wedges in the baking dish; they may overlap some, but do your best to make a single layer. 3. The braise: Scatter in the onion and carrot. Drizzle over the oil and stock or water. Season with salt, pepper, and the pepper flakes. Cover tightly with heavy-duty foil, and slide into the middle of the oven to braise until the vegetables are completely tender, about 1 hour and 40 minutes. 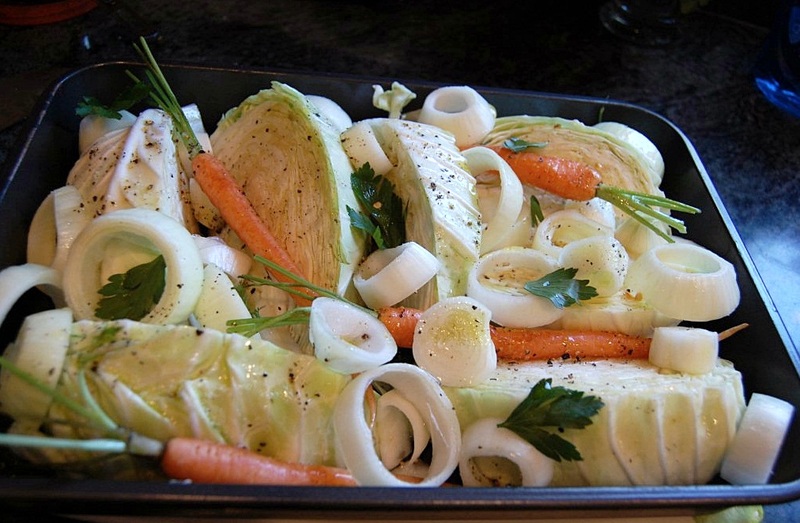 Turn the cabbage wedges with tongs after 40 minutes, add a little more stock if the pan is to dry. Don’t worry if the wedges want to fall apart as you turn them; just do your best to keep them intact. 4. The finish: Once the cabbage is completely tender, remove the foil, increase the oven heat to 400°, and roast until the vegetables begin to brown, another 15 minutes or so. Serve warm or at room temperature, sprinkled with fleur de sel or other coarse salt.